In the words of the legendary Jack Edwards: "Snowball 1, Hell 0." Tonight, it was Boston Bruins 4, Buffalo Sabres 3. Six games, series won, at least four more meaningful games to come. I'm happy, but I'm not sure that I can handle this. These underdog Bruins have now advanced as far as last season's vaunted team did. And they've done it with grit and guts and passion against a pretty good opponent, whereas last season's team rolled over sorry Montreal almost without breaking a sweat. Where this team was for most of the regular season, I don't know. And I also don't care. If they're peaking right now, so be it. Now is the prefect time. The Boston Bruins drive me crazy. I want to maintain an emotional distance from them. I don't want to get too wrapped up in them because they always disappoint in the end--and they will this season, too. I know they will. 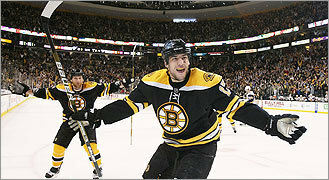 But I love the Bruins and have for almost 20 years now, and I can't keep that emotional distance. They won't let me. Along with BC hockey and, to a lesser extent, the Celtics, the Bruins carry me through the long, depressing New England winter, and my ultimate sports fantasy at this point--aside from seeing TCU win a national championship in football or West Ham win the Premiership--is seeing the Boston Bruins drink from the Stanley Cup. Heck, if I'm totally honest, the Stanley Cup fantasy might be No. 1 right now. It might have been for a while. I sat in Fenway heartbroken, even though I knew it was coming. It reminded me of the time in high school when a girl I had a crush on--a girl who was never, ever going to date me--brought another guy to a football game. It was totally normal, completely expected...and devastating. Sometimes rational thinking just can't overcome emotion. That's where I am with the Boston Bruins right now. I'm hooked--again. (I always was, really.) And when the B's do finally lose a playoff series and end their season, I'll be crestfallen--again. But, for now, they're still alive...and I'm still riding the emotional roller coaster, even if I'm not all that hopeful. Go B's!